Enjoy plant power. Soya & coconut with yogurt cultures. 100% plant-based. Rich in plant protein. Naturally low in fat and low in sugars. Free from dairy and gluten. 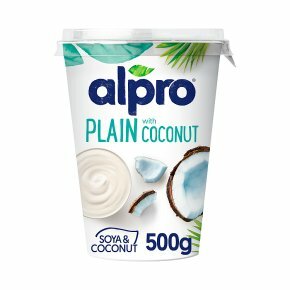 Suitable for vegans.Discover the goodness of soya and coconut, Alpro®Plain with Coconut. Enjoy this plant-based alternative to yogurt, with its subtle, refreshing coconut taste and silky texture for a unique taste experience - a great fit for a healthy lifestyle. ** ** Calcium contributes to normal muscle function.